Have you ever seen what happens when you give a toddler a toy sword? It’s a magical transformation. One second you have this gentle, juice box sipping pacifist, and the next you have an unbridled maelstrom of chaotic passion doing battle with everything in your house! The sounds of hollow plastic will ricochet off of everything you own. The poor dog will never be more confused in their life. And your little guy will undergo the epiphany we all do when we learn how fun it is to hit things with other things! But you can’t just have your boy going around aimlessly bonking stuff without him looking the part too. Ninjas and pirates are cool, it’s true, but no historical sword fighter better captures the imagination than the knight. Riding around on virtuous quests, emancipating beautiful maidens from sinister reptiles, retrieving chalices, and otherwise just being entirely righteous, knights will always be number one in our hearts. Plus armor looks cool, and ninjas don’t wear armor because it makes it hard to do backflips. 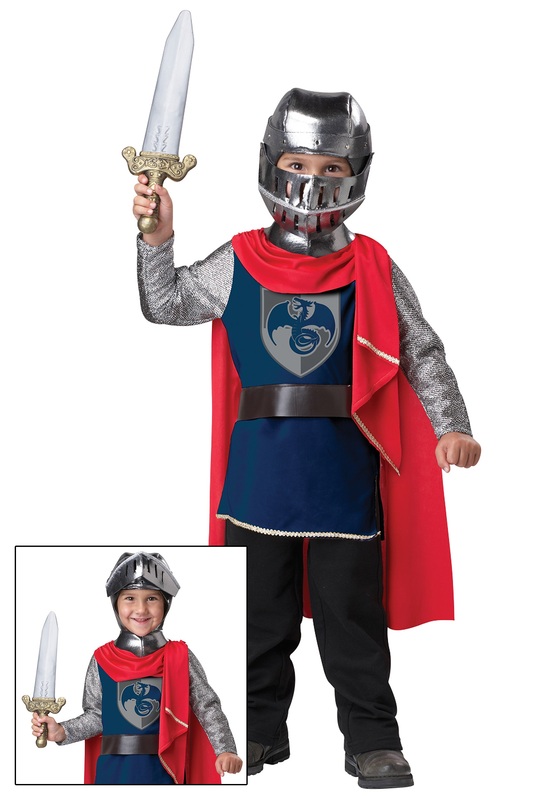 If your guy is on the path to glory, do him right with the Toddler Knight Costume. It comes with the heroic tunic with attached belt and cape, the soft but serious helm, and what’s about to become their favorite tool of wholesale destruction all pictured here. Anywhere is a battlefield if you have the look and the tools for it!